The Heart Attack Proof Diet was written by Dr. Michael Ozner who has been helping people to successfully prevent and reverse heart disease for more than twenty-five years. In Heart Attack Proof, he offers a six-week cardiac makeover based on the same principles that have worked for his patients. Dr. Ozner explains that coronary heart disease is preventable through a combination of blood tests, medication and nutrition. But, it is important to take action now, rather than waiting until you have a heart attack or stroke. However, even if you already have heart disease it is still possible to improve and even reverse your condition. Heart Attack Proof outlines a six-week plan that will help you make important lifestyle changes. Each week you will learn about specific aspects of heart disease prevention. You are also encouraged to undertake practical activities to enhance your cardiovascular health. For example, in week one you will learn about the latest blood tests and how they can save your life. Ozner provides detailed explanations of what these tests measure and why they are important. In other weeks you learn about exercise, stress management, and nutritional supplements. Ozner explains that many foods in the traditional American diet promote inflammation. On the other hand, a Mediterranean way of eating highlights foods that reduce inflammation. This is important because heart disease has been linked to chronic low-grade inflammation. The diet consists of fruit, vegetables, whole grains, legumes, nuts, omega-3 rich seafood, poultry and red wine in moderation. A high intake of plant-based foods provides fiber, vitamins and antioxidants to support general health. Processed foods and anything containing refined sugar or trans fats should be avoided. Red meat should be consumed in moderation; no more than five ounces a week. This is because it is high in saturated fats and omega-6 fatty acids, which increase the risk of atherosclerotic coronary heart disease. Heart Attack Proof says that exercise improves the efficiency of the heart and lungs and stimulates blood circulation throughout the body. Regular physical activity is essential to becoming heart attack proof. You should aim for thirty to forty-five minutes of exercise three to five times a week. The easiest way to get started is with a walking program. Walking ten thousand steps is the equivalent of doing sixty minutes of moderate intensity exercise. If you have time you can also enjoy extra activities such as tennis, golf, swimming or cycling. It is also recommended to do weight training once or twice a week. Yoga is also beneficial for its stress-management benefits. 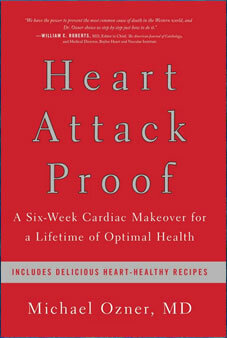 Heart Attack Proof: A Six-Week Cardiac Makeover for a Lifetime of Optimal Health retails at $19.95. Provides unique information about blood tests specific for prevention of heart disease. Mediterranean diet is supported by scientific research to reduce the risk of heart disease. The diet also provides protection against other conditions such as cancer, diabetes and Alzheimer’s disease. Emphasizes the importance of stress management. Dietary advice is similar to many of the other Mediterranean diet programs. Advanced cases may require more guidance and a stricter diet to effectively manage their condition. Heart Attack Proof is a six-week program to help you incorporate dietary and lifestyle behaviors that prevent and reverse heart disease. Dr. Michael Ozner translates the latest science and research into practical steps you can take to improve your cardiovascular health.